We all have those annoying Facebook friends who simply can't stop posting selfies. As soon as they cross the threshold of a location, they create a check-in status and they never fail to inform us if they feel "excited" or "relaxed" there. Eventually, we block such people - but then again, aren't we all like that at times? Psychologists warn that narcissistic, self-exposing behavior is on the rise nowadays, and many blame social media for this increase. Studies show that the levels of subclinical narcissism - or the personality trait that all normal individuals possess to a certain degree - have increased worldwide since the 1970s. Self-esteem is rapidly rising, too - according to data published in the Review of General Psychology, 80% of American students scored higher in self-esteem in 2006 than the generation from 1988. Scientists have also found that today's young people are more likely than older adults to have ever experienced Narcissistic Personality Disorder, or the clinical dimension of narcissism. Can we explain this sudden epidemic with the advent of social media? As it turns out, narcissism is not a stable personality trait, but rather a manifestations dependent largely on the environment. For instance, media can influence whether we act as narcissists. A recent study showed that people exposed to narcissistic reality TV characters exhibit higher levels of narcissism immediately afterwards. Other data also supports this theory: a paper from 2011 found that teenagers who use Facebook more often show more narcissistic tendencies than their peers. Increased Facebook use is directly linked to narcissism in adults, too, indicate results from a self-report study published this August. The reason lies in their nature. As psychologist Eric B. Weiser states - social networks may create or reinforce narcissistic tendencies because they serve primarily as self-promotional platforms. 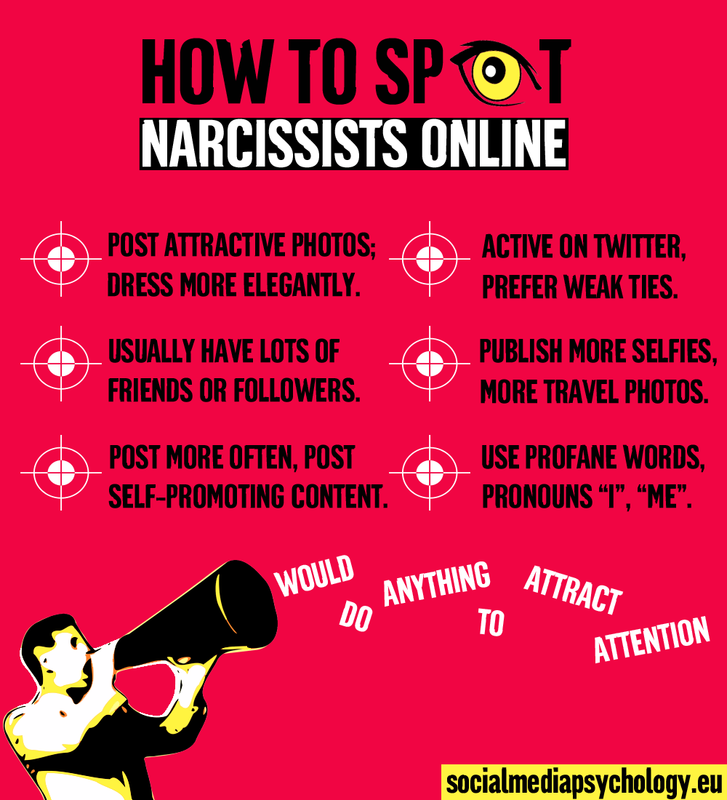 However, the opposite may also hold true - more narcissists will be active on social media as these platforms allow them to engage in exhibitionistic, attention-seeking, and self-promoting behaviors. Let's also keep in mind that people with narcissistic characters need admiration from others. Their grandiose self-views thrive on easy-to-obtain social media endorsements such as likes, shares, or new followers. Furthermore, narcissists prefer superficial connections with other people, and are really bad at listening and expressing empathy - this again makes social networks a very tempting environment for them. Although we all become narcissistic on social media, some remain more vocal then others in their self-expression. So how can you pick out narcissistic behaviors that go beyond the normal levels? The first thing to pay attention to is their photos - people with narcissistic tendencies care very much about pictures. For example, they're more likely to wear expensive, flashy clothing on photos, and their general appearance reveals a lot of preparation. These conclusions were made in a study that aimed to discover whether people can determine if others are narcissists just by looking at their photos. As part of the process, researchers identified 16 visual cues that reveal if a person in a photo is narcissistic, and all of those cues were related to narcissists' desire to be the center of attention. For example, female narcissists tend to wear make-up and show cleavage more often than other women. Male narcissists are more likely to wear clothes that enhance their social status, and less likely to have sunglasses in photos. As a rule, people with higher scores on narcissism are more motivated to select profile photos on Facebook that emphasize their attractiveness. This data comes from Ludwig-Maximilians-University of Munich. The research team analyzed the Facebook presence of 288 students and asked them about their motivation to choose particular images. Similar results can be found in a more detailed paper that examined how narcissism is generally manifested on social media - the researchers coded the Facebook pages of 156 students according to criteria such as photos, activity on the platform, number of lines in the About section. A group of independent "observers" was then asked to view each Facebook profile and answer questions on the content. The findings showed that, indeed, participants with higher scores of narcissism post more attractive photos. Their images were also perceived as "more entertaining" by the external observers. The study also discovered that narcissistic users have more Facebook friends than others, create more posts in general, and more self-promotional posts than informative ones in particular, while they also write longer descriptions in the About section of their pages. The researchers linked the larger number of friends with the fact that narcissists prefer weak ties, or shallow connections, and like to win Facebook friends as trophies. Another possible explanation could be that narcissistic people are typically extroverted - according to a meta-analysis of 62 studies on social media and narcissism published recently, narcissists' tend to have more friends and generate more content on social media may, in part, be linked to their extraversion. If you assume that excessive posting on social media would also mean that narcissistic individuals spend more time on their smartphones, well, you are wrong - it turns out, surprisingly, that narcissists are less dependent on the touchscreen than others. A smartphone data-tracking study analyzed how much time people spent on mobile every day and found that participants with higher smartphone usage typically have lower scores on the Narcissistic Personality Inventory. According to the authors, this can be explained by the fact that people mostly use their smartphones for social interaction, which is exactly what narcissists avoid. Monitoring social media feeds of others or experiencing the fear of missing out (FOMO) are not typical for narcissism, but relate more to neuroticism. Another form of proof that someone is narcissistic can be found in his or her writing style. Do they use "I", "me" or "my" a lot? Do they swear? Researchers from University of Georgia did a linguistic analysis on individual Facebook pages based on the fact that narcissists tend to speak more about themselves and use more personal pronouns. However, when there were no first-person pronouns in the texts, narcissistic authors used other verbal tactics to attract attention to their content - they used more profane and antisocial terms. A linguistic analysis of 1000 Twitter accounts yielded similar results - people with higher levels of narcissism were found to use more words about anger and negative emotions and fewer words about social interaction. Interestingly, several studies have also found a connection between narcissism and cyberbullying. Although there are different opinions on what type of narcissism better predicts cyberbullying behavior, one thing is clear: people with an emphasized narcissistic trait often try to attract attention by using bad language or more direct verbal attacks. A common characteristic for the social media presence of narcissists is an abundance of selfies. Results from a survey completed by 1200 US residents reveal that two dimensions of narcissism positively correlate with the frequency of posting selfies on social media. These are the "Leadership/Authority" type, attributed to individuals who seek power and authority over others, and the "Exhibitionism/Grandiosity" type, which reflects self-absorption, vanity, and attention-seeking. And There's more to that. Not only are narcissists more likely to produce selfies, the very act of taking selfies alone makes people more narcissistic. Results from a longitudinal study show an increase in the subsequent levels of narcissism in people who photograph themselves more often. Another paper examined the relationship between narcissism and various types of selfie posting behaviors - posting solo selfies, selfies with a group, and editing selfies. The results indicate that narcissists post more solo selfies and edit their selfies more often than other people. Lastly, thought-provoking data: researcher David G. Taylor from Sacred Heart University found that narcissistic people post more travel photos on Facebook. Certainly it doesn't mean that they gallivant more. Travel images are a type of self-promoting content, and as such they are published with the idea to attract attention and enhance our social status. There are more narcissistic users on Twitter than on Facebook, according to a study from 2013. Shawn Bergman and his colleagues analyzed posting behaviors and motivation for social media use of 500 students and found that college students who scored higher on the Narcissistic Personality Inventory preferred Twitter. This can be explained wby the fact that the platform encourages posting frequent updates and accumulating shallow, non-reciprocal relationships (followers), which are most likely desired by narcissists. However, the researchers acknowledge that the nature of the two platforms is different, and that Facebook also offers opportunity for self-promotion with features aimed at embellishing one's personal Facebook page - for instance, changing the profile photo, filling out the About section, adding one's interests, etc. The results from the study also show that Facebook is the preferred option for adults with narcissistic tendencies, while Twitter remains the platform of choice for younger narcissists. Faster growing visual platforms such as Instagram or Snapchat must also be considered. Instagram, for example, was found to attract younger audience with narcissistic tendencies, and the main motivation of narcissistic Instagram users was to appear "cool" in the eyes of their followers. In another study, 124 students filled out an online survey that measured both their levels of narcissism and their preference for specific social media platforms. Regular users of Snapchat and Instagram exhibited higher levels of the Exhibitionism/Grandiosity dimension of narcissism than users of Facebook and Twitter. We're all narcissistic to some extent. In the digital zeitgeist, self-exposure has become an easy way to communicate, which many of us embrace. Ironically, however, people create polished online versions of themselves with the aim to attract others, and harvest just the opposite results. The truth is that narcissistic content is perceived unfavorably by social media users. A recent study collected status updates from 316 Facebook pages and presented them as screenshots to a group of people. To ensure objectivity, details like profile photos, names, and other page information were blurred. The observers were asked to evaluate the status updates based on criteria such as likeability, successfulness, and likelihood of being friends with the author of the status. The results showed that people who posted narcissistic status updates (e. g. ''Purging my friends list. Good luck making the cut'') were perceived as less likeable, less successful, and less worthy of friendship than those who posted less narcissistic or neutral status updates (e. g. ''I know everything will be okay. Nobody can bring me down''). So, think twice before you humblebrag about a new job or upload another selfie. Instead, maybr link to a cat video: it'll certainly provoke more honest likes. The vector images used to create the visuals above are from Pixabay.com. Many thanks to all the authors.